"Third Fridays" is a legal talk show featuring moderator Christian Sison. We found 10 episodes of Third Fridays with the tag “#dfd1”. 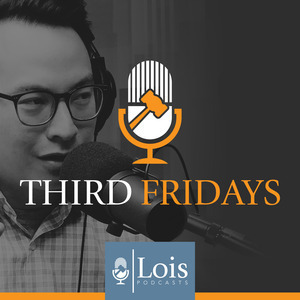 Host Christian Sison welcomes attorney Greg Lois to the Third Friday podcast to discuss problem issues in dual-employment claims, where lent or borrowed employees bring claims for worker's compensation benefits against two employers. Host Christian Sison welcomes his law partner attorney Tashia Rasul to the show in advance of her well-anticipated speaking engaged at the annual Claims and Litigation Management conference in Orlando. The two discuss the difference between reporting accident claims and reporting compensability decisions to the WCB. This was then applied to how LOIS specifically defends construction claims, with the help of Tashia’s Construction Practice Team. Host Christian Sison is joined by special guest Amy Figueroa and attorney Jeremy Janis for a wide-ranging discussion on the state of board panel appeals in New York. Attorney Declan Gourley joins host Christian Sison to discuss Medicare Set Asides in workers' compensation claims. The attorneys discuss an interesting issue arising from air ambulance services and fee schedules. Attorney Christian Sison and Attorney Joseph Melchionne discuss the practical and the tactical use of Independent Medical Evaluations (IMEs) in New York Workers' Compensation cases from a defense standpoint. An interesting New York Board Panel Decision is discovered by Timothy Kane who joins host Christian Sison for his 2nd guest appearance on the podcast. Apportionment and date of contracture become ripe issues when an established occupational disease claim reaches permanency. Does the Board Panel Decision create guidance that could result in more accurate exposure analysis? Can this be used by carriers and self-insureds to close cases faster? Listen in to this discussion. Attorney Jeremy Janis joins Christian Sison to discuss the "grey area" argument in a recent case involving traumatic injury in a New York workers' compensation case and the resulting appeal in light of the new scrutiny placed by the Board on cover sheets. After last month’s episode discussed a favorable Board Panel Decision to employers and carriers, life at the Workers’ Compensation Board resumes normal claimant-friendly activity with the recent Third Department decision in Taher v. Yiota Taxi. Andrea Abudayeh joins Christian Sison to discuss how the Taher decision impacts permanency cases involving established schedule and non-schedule sites. How can we best defend cases in a post-Taher world, and how are Judges applying this case going forward? Christian Sison reveals a favorable Board Panel Decision and invites Joseph Melchionne to the podcast to analyze the case. Joseph, the trial attorney responsible for securing a key win for the firm’s client, recaps how all parties worked together to reach the common goal. Christian and Joseph detail the exact #DefendFromDay1 strategies that were used to maintain and reinforce the defense to compensability.